According to Indian experts, the revival of our economy is not possible without the contribution of the banking sector. Keeping this in mind, investors have extensively invested in the banking sector in the last 5 years. Banking stocks are the lifeline of the Indian stock exchanges. This can’t get more evident than when the announcement, made in October 2017, to invest Rs2 lakh crore in the banking sector drove the BSE Sensex to climb the magical 33,000-mark. NIFTY50 has nine bank stocks. That alone can explain the importance of the banking sector. The Lok Sabha, too, has approved Rs80,000 worth of recapitalization bonds for public sector banks. This will further help banks to tackle bad loans and improve their valuation. According to Indian experts, the revival of our economy is not possible without the contribution of banking stocks. Keeping this in mind, investors have extensively invested in the banking sector in the last 5 years. As far as mutual funds are concerned, the banking sector has received maximum investments followed by auto and IT sectors. Today, every bank’s stock is considered bullish (will increase in price in the future) by many experts, and it is recommended that you buy and hold banking stocks as long as possible. While it is true that the banking stocks are not performing as they should, it is still expected their value would rise in the future with support from the government and the RBI. As share prices of banks have are down, it is the perfect time for investors to buy and hold these shares for the long term. 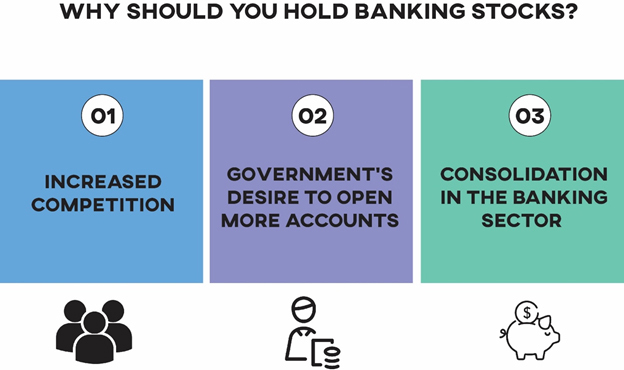 Why should you hold banking stocks? Competition among banks is continuously intensifying, and this is one of the key factors to hold onto your banking stocks. The RBI is coming up with constant changes in the banking policy. It has also put pressure on banks to perform better and tackle the bad loans' menace. It is also issuing new licenses. The reason RBI is issuing these licenses is because of the need for increased financial inclusion. Increased financial inclusion will only drive the prices of the banking stocks upwards in the future. These new banks will come up with a better offer, and existing banks would have to offer something even better. This healthy competition has become the reason because of which you should hold your banking stocks. Under the Pradhan Mantri Jan Dhan Yojana (PMJDY), the government has allowed banks to open Zero balance accounts for people who don’t have a bank account. As of February 2018, 310.7 million new accounts have been opened under the scheme with estimated deposits at Rs74,534.79cr. While it is true that a chunk of these accounts will be inoperative, this has steadily increased the value of banking stocks. More accounts are being opened every minute, and this would mean that prices will rise even higher. Our government has identified the need for financial inclusion, and there is no doubt that more and more schemes like PMJDY will be launched to allow people to participate in the banking process. Introduction of new technologies like BHIM and UPI has also improved consumer interest and has increased financial inclusion. This will increase the contribution of the banking sector towards our economy. Therefore, holding shares of top Indian banks at a time when financial inclusion is at its peak will reward you handsomely. Best of all, the government’s step to merge small non-performing banks with banks having a huge market capitalization has turned out to be tremendously rewarding for the shareholders. You must already know that five other banks were merged with the State Bank of India (SBI) earlier in 2017 and the success of this step has resulted in the revival of the banking sector. The government has also made a three-person committee headed by finance minister Arun Jaitley to look into the possible merger of other non-performing banks with big Indian banks like SBI or PNB. This consolidation will have a massive impact on our economy in general and on the banking sector in particular. For example, if you have shares of Punjab National Bank and three-five banks are merged with it, imagine the impact on PNB's share prices. The number of accounts and the value of deposits with PNB will increase by leaps and bounds. This will surely increase its share prices. Based on this proposal, you should wait and hold your bank shares. Do not excessively worry about recent developments in the banking sector. The PNB fraud may have lowered the valuation of most banks, but, at the same time, it has also lowered its share price. There is no doubt that a big bank like PNB will cover bad debts and increase its valuation in the future. You can identify undervalued banking stocks, buy them for cheap in the present, and hold them for the long-term to reap gains in the future.